Japanese game makers Idea Factory, Gust and Nippon Ichi Software have teamed up for a new PS3 role-playing-game called Trinity Universe. Trinity, geddit? The game is a 3D dungeon crawler RPG and features two plot lines: Goddess and Devil King. 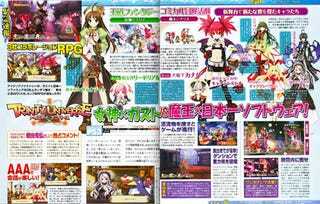 Gust worked on the scenario for Goddess, while Nippon Ichi did the Devil King scenario. Idea Factory is developing the title, which is currently 60 percent. Trinity Universe is penciled in for an August release in Japan.